This page details our efforts to finally put a name to a spectacularly large and unidentified Harvestman found at Worksop back in 2009 and the results of a series of surveys specifically targeting this species in October 2012. It has now been confirmed as being the invasive and still scientifically unidentified Leiobunum sp. A, that has appeared in several European countries since 2004. 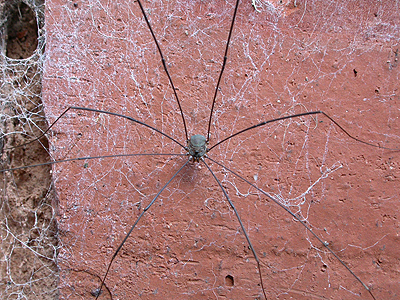 It is notable for its extremely long legs and for forming enormous congregations on the walls of buildings. Although possible to identify this species from photographs, additional specimens were looked for in early December 2011 when our tentative identification was confirmed, but the date proved too late and no further specimens were found. However, Paul Richards found 29 adults and a juvenile male on a factory wall in Barnsley on 22nd September 2012 and three years to the day of our initial record, we eventually located 22 adults on the walls of Worksop Priory on October 13th 2012. 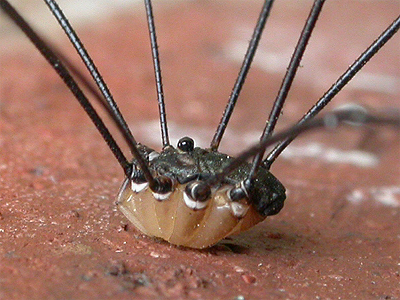 The first records of a large, dark Leiobunum Harvestman came from near Nijmegen, The Netherlands in October 2004. Experts using Martens 1978 key, could not identify it as being any north-western or central European species, nor were they able to assign it to any European representative of the genus known to date. Many more additional records were obtained from several localities near to Nijmegen during 2005 and 2006. First records from other European countries are Germany and Austria (2006) Switzerland (2007) and from France in 2009. 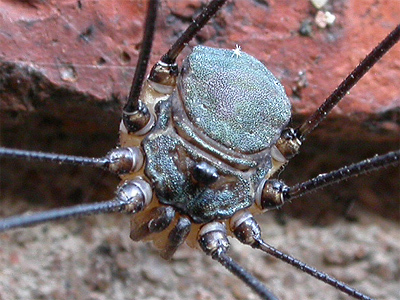 It is believed that this Harvestman arrived in Europe via importation. Efforts by Wijnhoven, Schönhofer & Martens to contact several specialists, saw them concentrate on Spain and Northern Africa, and then Mexico and the southern parts of the United States, in order to determine it's origin. All their efforts have so far drawn a blank. Recording and photographing invertebrates, occasionally throws up something obviously very different from what you have seen before, but still remains unidentified despite a great deal of research. The result is that the images get put into the 'unidentified folder' and often sit there for months or even years. 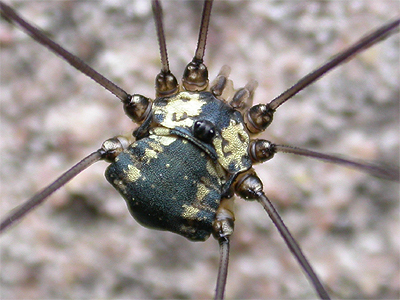 Images of this Leiobunum type Harvestman taken at Worksop in October 2009 did exactly that. Yet the inability to ID it, probably niggled us more than any other species and the 'unidentified folder' was subsequently opened several times in the intervening period. In November 2011, a possible breakthrough came whilst searching for images of Platybunus pinetorum, a recent addition to the UK species list discovered by Paul Richards at Sheffield in June 2010. Images found during a Google search for the similar looking (to the Worksop specimen) Leiobunum tisciae, turned up images of an invasive and unknown Leiobunum found in parts Germany, Switzerland, The Netherlands and Austria. Further research quickly led us to the excellent paper "An unidentified harvestman Leiobunum sp. 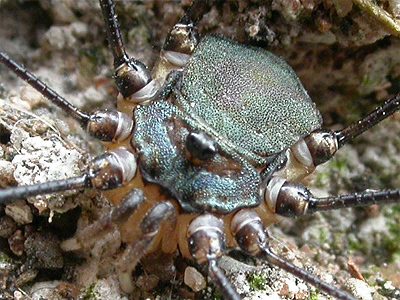 alarmingly invading Europe" (Arachnida: Opiliones) by Hay Wijnhoven, Axel L. Schönhofer & Jochen Martens and published in December 2007. There is a link to this paper at the bottom of this page. One particular image of a male in the paper, seemed to match the Worksop specimen perfectly, so we emailed images of the Worksop specimen to Jochen Martens and Paul Richards for possible identification and confirmation. Both replied back with the conclusion that this is indeed Leiobunum sp. Jochen replied "Certainly, it is the Leiobunum species presently extending it range within central and now even to NW Europe. Very amazing that it reached the British Isles with so short delay. I understand that only this male was present. This is unusual because in most cases the local population enlarge quite rapidly and form the mass aggregation of which you certainly have seen photographs. But, locally, this may be only the beginning. So, please, keep an eye on the further development and ask around. According to my knowledge, this is the first record in the U.K. Many thanks for informing me (and hopefully so on further records to come)". The specimen was found on the wall of a Worksop house on the Prospect Estate at approximately SK 59226 80970. This is situated off Gloucester Road, immediately north-west of Bassetlaw Hospital. The house is situated in a row of terraced town houses built in the 1970's, with small gardens facing east at the front and west at the back. Both gardens are enclosed, well planted with mature shrubs and conifers and sheltered by fencing. It is a typically designed estate of it's time - a maze of paths and cut grass areas etc. Houses are arranged in short rows facing different directions. Despite being part of an urban estate, this small garden has supplied us with numerous interesting invertebrate records, with a healthy list of Harvestmen including Odiellus spinosus, Oligolophus tridens, Opilio canestrinii, Opilio parietinus and Paroligolophus agrestis. 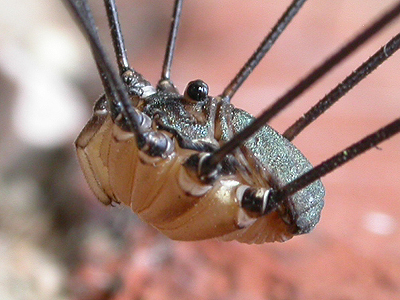 Surprisingly, we never recorded either Leiobunum rotundum or L. blackwalli, two common, long-legged Harvestmen. Being familiar with many of Nottinghamshire's Harvestmen for a number of years, a very dark, extremely long-legged Leiobunum type Harvestman found on October 13th 2009, immediately stood out as being very different from anything else we had seen before. The Harvestman was found resting on a shady, north-west facing wall in the rear garden of the property, in a quite open position relative to the Ivy growing up the same wall. It was collected and taken home for photographing before being released. 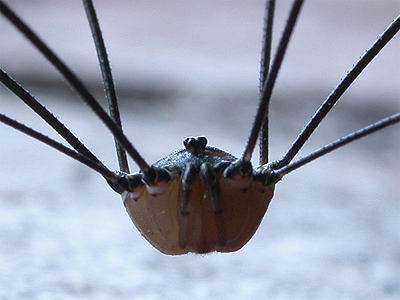 This is a large species, much longer-legged and robust than other Leiobunum Harvestmen found in the UK. The body appears dark, almost blackish, but is noticeably dark metallic green, with only a few light markings. There is only minor dimorphism in coloration and dorsal pattern within males and females. Ventrum and coxae of the legs are warm pale yellowish to pale light brown, strongly contrasting with the dark trochanters, legs and dorsum. 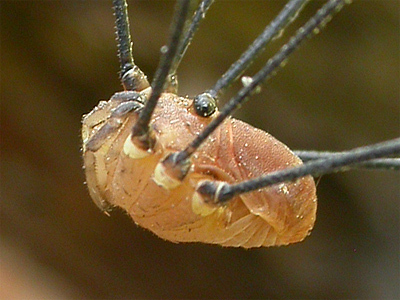 The legs are conspicuously long and slender, dark brown to black. Females have conspicuous white tips to the tibiae, which darken through age. Lateral view of male Leiobunum sp. A collected at Worksop 13/10/09 and typical male Leiobunum rotundum shown upper right. Additional lateral view and silhouetted front view of male Leiobunum sp. A, collected Worksop 13/10/09. Dorsal views of male Leiobunum sp. A, collected Worksop 13/10/09. We had thought that after two years since we first recorded Leiobunum sp. A, it would now be sat on most house walls in the area of the original record. In late September 2012 we briefly tried searching the Prospect Estate again and still had no luck. Fine weather over the weekend of October 6-7th 2012, meant that conditions were again suitable, but despite several hours searching Bassetlaw Hospital and Worksop Priory Gatehouse each day we returned home failing to get the target species. We made another visit to the area on October 13th 2012, a date which was already significant, as it marked the date on which we had first found Leiobunum sp. A back in 2009. We actually only realised the closeness of the date when researching and starting to write up the results of our Harvestmen surveys from the previous weekend on October 12th 2012, but it suddenly became an amazing coincidence when we returned to Worksop for one more search. The weather forcasters had predicted showers on the day, but after being cloudy and dry all morning, the sun began to break through and we thought of going back up to Worksop for another survey and hopefully to find our elusive quarry. Our first stop was a roadside wall on an industrial estate on Sandy Lane, that we had drove past the week before. We hoped that Leiobunum sp. A had possibly originated from one of the units there via importation. 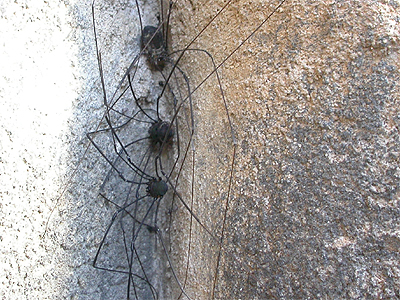 Unfortunately, the wall turned out to be devoid of any Harvestmen at all and so we moved on. 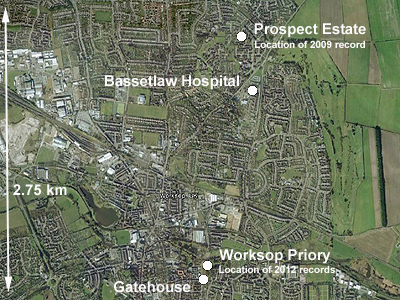 Next it was on to Bassetlaw Hospital and then across the road to the Prospect Estate. Again, very thorough coverage of all shaded walls and potentially suitable resting places were searched and although we did find plenty of Harvestmen, none were Leiobunum sp. A. By now, we had started to give up hope and looking for somewhere new to search. We tried a couple of old brick built factories on Priorswell Road, before going to have another look on the walls of Worksop Priory and Gatehouse. The Gatehouse once again held a few examples of Phalangium opilio and Opilio parietinus, but then we found a male Leiobunum blackwalli by the door to Worksop Priory. Not having many photographs of L. blackwalli, I took the opportunity to try and obtain more and it was thanks to the extra time spent taking photographs, that Dilys found a much larger Harvestman further along the wall. It was instantly recognisable as being Leiobunum sp. A and after much effort, we had finally been rewarded with our target species. Some documenting photographs were taken, before we carried out a more detailed search of the Priory walls we could access. We were immediately successful and went on to record a total of 13 males and nine females along the southern wall of the Priory. All the Leiobunum sp. A we found were more or less at eye level, with only one female found about 20 feet up and they clearly preferred the vertical joints or tight recesses built along the southern side of the Priory walls. 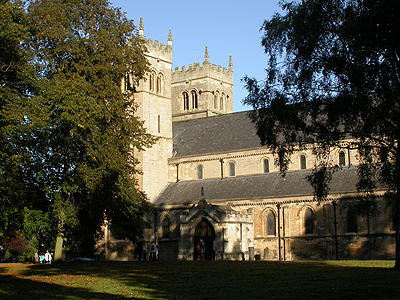 The above photograph of Worksop Priory was taken on Sunday October 7th, when the public were arriving for the Sunday service, so it was thought inapproporiate to survey all the walls at the time. In relation to the photograph, most adult Leiobunum sp. A were located just left of the entrance (including a small aggregation of ten adults) with smaller numbers found in other recesses along the Priory wall, to the right of the entrance. The 2.75 km distance between the 2009 record and those from 2012, would seem to indicate that Leiobunum sp. A should be present somewhere else between the two sites and it should certainly become more widespread, if it isn't already. Due to the increasing number of surveys and records of Leiobunum sp A, we have now put all subsequent counts from Worksop Priory, on to a new page.